We began with some research on what clones have done well in Virginia. When you order vitis vinifera wines (which encompasses the European-style grapes most people are most familiar with, from Chardonnay to Cabernet Sauvignon), you’re making two decisions for each variety – the type of rootstock to use and the clone that will be grafted onto it. At a minimum, it’s important that rootstocks be resistant to such pests as phylloxera, the root louse that all but destroyed European vineyards in the 19thcentury, and nematodes, but we’re also looking for roots that will inhibit excessive growth, withstand cold winters, and work well in our soil, which is clay and loam. Long story short, we’ve pretty much decided to go with a root stock known as 101-14, the same root stock on the Cab Franc vines we’ve already planted in both the Fairfax and Nelson County vineyards. 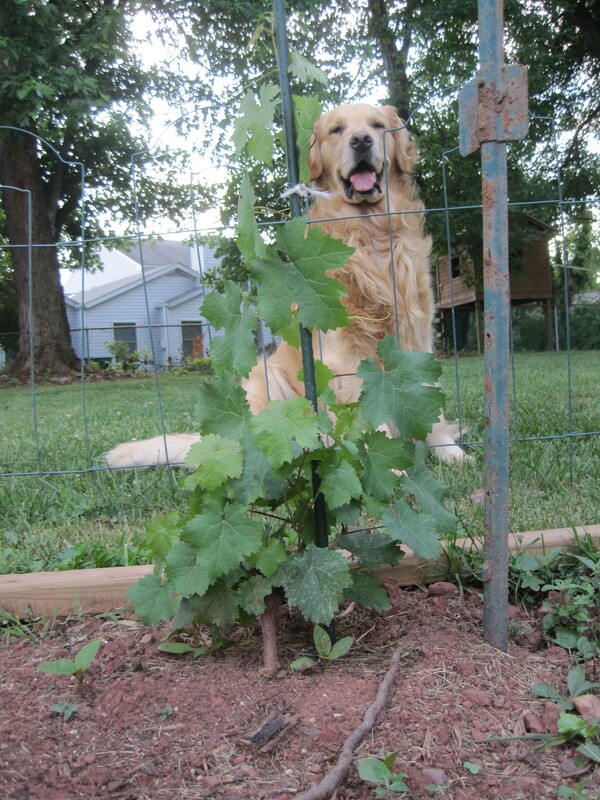 Here's a Cab Franc vine in the Fairfax vineyard (with Phoenix the Vineyard Dog standing guard) The clone is FPS 4, grafted onto 101-14 rootstock. The picture was shot a few months after planting. vines, and it is presumed that the clone will exhibit the same qualities and characteristics as the vine it was taken from. But variations occur, and if a new vine exhibits differences that are deemed to be desirable, it may be characterized as a new clone and propagated more widely. So there isn’t just a single Viognier or a lone Cab Franc. There are a number of different Cab Francs, each classified as a separate clone, and each exhibiting different qualities, not just in the way they grow, but in the quality of the wine they produce. So the choice of clones was very important to us. We relied heavily on Tony Wolf’s indispensible book,Wine Grape Production in Eastern North America, and came up with the following oddly-named clones (actually, all clones are oddly named; they sound a bit like the parts in an erector set) : For Cab Franc: ENTAV 214, 327, or 623 (whichever one we can get); for Petit Manseng: ENTAV 573; Petit Verdot, ENTAV 400, and Viognier: ENTAV 642. I mentioned Merlot in my last post, but we’ve pretty much decided that’s a clone too far for this year. We called one of the nurseries a few days ago, assuming that when we told them we planned to order a whopping 125 vines that they would fall all over themselves to help us, perhaps even offering to fly us out to California to get a look at the nursery. (You know I’m kidding, right? I would guess that their average order is measured in multiples of a thousand vines.) Our actual assumption is that we’d be able to get someone on the phone who could talk to us for a couple of minutes and then take our order and credit card number. The nursery was Sunridge, which seems to be one of the very best in California, and the woman who worked with us could not have been friendlier or more helpful. Unfortunately, they didn’t have most of what we wanted. It turns out that they didn’t develop most of what we wanted “on spec” this year. “On spec” seems to mean roughly the same thing in the grape vine nursery business as it does in the housing industry, where developers either build to order for a buyer who puts money down in advance, or build on spec in the hopes that buyers will show up with cash in hand. Whatever the case, they had the Viognier clones, but nothing else among our favorites. Okay, that was a surprise. We had just assumed that everything on the web site would be immediately available and that all we had to do was call and ask for what we wanted. Now we are wondering if we will have to settle for clones that aren’t exactly what we want or wait another year to get clones of our dreams. Given that it takes a minimum of three years before the vines begin producing grapes, and a year or more after that before the wine is ready to drink, you only have so many chances in a single lifetime to get it right. And in our case, we only have so much land to devote to this enterprise. Putting off the planting for a year is not an option. My wife, the Vineyard Goddess, sprang into action, and promptly identified a number of nurseries that distribute the varieties of grapes that we’re looking for. Great news! The bad news, however, was that only a handful sold the ENTAV clones we’re looking for. We knew that there are only a limited number of ENTAV-approved nurseries in the United States, but we didn’t know how limited that number was. It turns out that only four nurseries in the U.S. are licensed to sell ENTAV clones, and two of them appear to have merged. Of the remaining two, one doesn’t have a web site, which is making it difficult to contact them, and the fourth has been a bit slow in getting back to us. We think there might be other options, including Mercier California. According to the National Grape Registry, which is hosted by UC-Davis, Mercier has a presence in California. However, Mercier’s web site is tout en francias, and we are wondering if their ENTAV vines are shipped from France. Not that I care where they are shipped from. However, I do care about shipping costs. A friend who spent most of his life working vineyards in Bordeaux highly recommended Mercier, so we are hopeful that this is a viable option. Okay, apparently purchasing vines isn’t as simple as logging into Amazon and selecting one-day shipping. But most of the things in life that are worthwhile require some extra work. And if anything warrants extra labor, it’s good wine. We’ll keep at it until we get it right. And with luck, we’ll be ordering those vines next week!